PARIS - The Canadian government has sharplyreduced the amount of time it takes to collect evidence of illegal fishing andother infractions in its territorial waters by deploying high-cost aircraftonly after Canada?s Radarsat 2 satellite has given an initial alert, accordingto Col. Francois Malo of Canada?s Department of National Defence. Malo saidCanadian authorities plan to extend their operational maritime surveillancecapabilities with the next-generationRadarsat system, called Radarsat Constellation, by adding an AutomatedIdentification System (AIS) terminal to each Radarsat Constellation satellite. Thedecision is in parallel with a program by Canada?s Com Dev International?of Cambridge, Ontario, which is using its own funds tobuild several AIS-equipped small satellites after reporting a success of AIStechnology in a satellite Com Dev launched in April 2008. Malo said using Canada?s CP 140maritime patrol aircraft to survey Canada?s coastline ? 243,770 kilometerslong, with 250 ports and a traffic volume of 1,700 ships per day ? takes up to180 hours of flight time to collect the necessary evidence. The cost ofoperating the aircraft is about 27,000 Canadian dollars($22,330)?per hour, Malo said here April 28during a presentation to the Milspace 2009 conference, organized by SMi Group. In a test program called OperationDrift Net, Canadian authorities took 80 Radarsat 2 scenes to scan the broadcoastal area. High-resolution Radarsat 2 imagery was used once a suspiciousvessel was spotted to determine whether it was worth an overhead pass by theaircraft. The result, he said, was the aircraft confirmed the activity just sixhours after takeoff. ?Deterring illegal fishing wouldtake a huge amount of aircraft time and we now use the satellite to find thevessels in question before cueing the aircraft,? Malo said. Malo said Canada?s defense forceshave begun their own ship-identification pilot program by using Radarsat datacombined with AIS signals produced by satellites launched in 2008 by OrbcommInc. of Ft. Lee, N.J. Orbcomm is building a second generation ofmachine-to-machine messaging spacecraft, all of which will include an AISterminal on board. Malo saidCanadian authorities in March started integrating Orbcomm AIS data into marineimages taken by Radarsat as part of a program to monitor Atlantic tuna fishing.The data is promising, he said, but suffers from the fact that the Orbcomminformation is not easily correlated with the Radarsat data because the twodata sets are coming from two satellites in different orbits. For thisreason, he said, the Radarsat Constellation program, expected to featurebetween three and six spacecraft, ?will have an AIS capability. Our objectiveis to have four looks at a given area per day of any area in our zone ofinterest, with eight minutes of SAR [synthetic aperture radar instrument] perorbit.? Malo saidCanadian officials have begun talks with Canada?s allies, including the NATOalliance, to determine whether other governments might take part in theprogram. In anotherproject aimedat ship surveillance, Canada?s defense forces have installed Radarsat 2ground stations, one on the east and west coast of Canada, to collect data onoverall ship traffic. The program, called Polar Epsilon, cost 64.5 millionCanadian dollars and is designed to deliver information on a ship?s position,length, speed and heading within 15 minutes of being imaged. 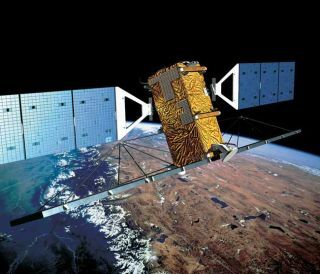 Com Devofficials say they expect to provide Canadian forces with the AIS technologyfor Radarsat Constellation based on data from the Nanosatellite Tracking ofShipstechnology demonstration satelliteplaced into low Earth orbit in April 2008. The 8-kilogram satellite was placedinto a 630-kilometer sun-synchronous orbit to determine whether Com Dev?sproprietary AIS technology works as designed. Under contract to the CanadianSpace Agency and Canada?s defense forces, Com Dev is building a follow-onMaritime Monitoring and Messaging Microsatellite (M3MSat), to be launched in2010. The M3MSatwill also inaugurate a Com Dev-developed satellite platform the company hopeswill be used for multiple future Canadian government programs, Com Dev ChiefExecutive John Keating told shareholders April 22. Com Dev is currently seekingstrategic partners to help finance the rollout of a commercial AIS system. ?We aren?tgoing to bet the farm,? Keating said of the AIS and microsatellite development efforts. ?Appropriate backup plans are in place. We do not expect to generate any meaningfulrevenue from AIS in 2009, but this next year will be crucial in determining thesuccess of the overall program. ?